Luxury USB drives come in all different types, some are of course over the top and look ridiculous. 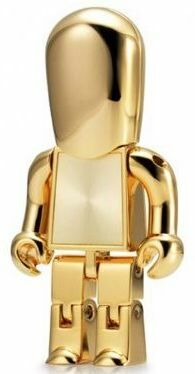 These little USB Men manage to actually look refined and even cute. All the while still definitely being a higher end USB drive. These little guys bend so that you can have them sit patiently at the edge of your desk, just waiting for their chance to be useful once again. They come in both silver as well as gold forms. No matter which one you choose though, these are still going to be the exact same price. Admittedly, the price isn’t too pretty either. Each one is going to cost you £55.00 or about $88. For that price, one might hope for at least 4 or even 2GB of memory. Sadly though these will only get you a whopping 1GB. For those that aren’t so put off by the price and lack of space, you can find them through the Gift Library. A very good looking pretty pen drive that too at affordable cost. Pendrives are very useful & this information has helped me to get the right pendrive for myself.